We are Friday, my mom called me: "what are you doing for lunch today?" she asked - couscous, I replied. It's not every Friday that I make couscous, even though M wouldn't mind, but in North Africa (where I am from) most families eat couscous on Fridays. It's part of the culture. Couscous, in Arabic "taam", which translates literally: "food" is the signature dish of this region. There are many ways to prepare couscous: Savory, with meat and vegetables. With fish or sausage, or sweet with dried fruits, nuts, honey, spices and sugar. The most popular version is the couscous with lamb and vegetables stew. Now, when it comes to preparing the couscous, let me say something very important: if you want an authentic couscous forget preparing it by just adding water (That's what the directions on the box would ask you), because you will never get the same texture and taste. The right way to prepare couscous is to steam it in a couscous pot (couscoussier) twice. It sure takes more time than just pouring water over it but it's so much worth it. For this recipe, I always use plain couscous . to prepare the couscous, rinse the couscous with a little bit of water.Drain the excess liquid and let stand for 15 min. The couscous will become sticky.Try to get it to it's grainy aspect by mixing it with your hands in a circular motion.Meanwhile start boiling some water in the bottom part of the couscous pot. Steam the desired amount of couscous (I used one pound)in a couscous pot: the couscous on top, for about 15-20 minutes until you will feel that the couscous became a single block when touching it slightly. Without turning the heat off, remove the top of the couscous pot and add to the couscous 1tsp of salt, 1tbsp of oil and one ladle of hot water from the bottom of the couscous pot. Let it stand for about 10min and invert the couscous into a large bowl. Start mixing it with your hands by rubbing them together in a circular motion. Then, slowly add some hot water, always from the bottom of the couscous pot, to the couscous. Mix it all together carefully and add more water until you will feel the couscous soft on your hands and on your tongue. But, be careful to add too much water. Put it back on the couscous pot and let it cook for another 15min until you can see the steam coming from the couscous.Invert it back again into the bowl and add 4 tbs of butter. Let it melt on the couscous ,and when the couscous is cool enough to handle, mix it rubbing your hands together in a circular motion. -salt, pepper and 1tsp cumin. Saute the meat in a little bit of oil until well browned .Add the onions and all the vegetables.pour in the liquid ,the saffron , the tomato paste , salt, pepper and cumin. Cover with a lid and cook for 30min. 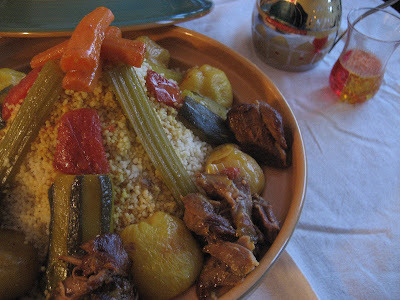 Serve the couscous with the vegetables on top, the meat around and pour the stew to suit your taste. Pour preparer le couscous (j’ai utilise 500g de couscous) , laver-le avec un peu d’eau ,puis l’egouter. Mettre de cote pour 15min. Entre temps remplir le couscoussier d’eau et le mettre a bouillir. Le couscous, vous le verrez , deviendra collant . Frictionner-le entre vos mains pour qu’il redevienne granuleux. Mettre le couscous dans le haut du couscoussier et laisser cuire environ 20 minutes ou jusqu’a ce que le couscous forme un bloc quand vous le toucher legerment de vos mains. Enlever le couscous du feu et mettre desssus 1c.c de sel, 1c.s d’huile et 2 louches d’eau que vous aurez recupere du bas du couscoussier.Laisser le couscous de cote sans le renverser pendant 10min. Transvaser le couscous dans un grand bol et commencer a y ajouter tout doucement de l’eau du couscoussier .Frictionner le couscous entre vos mains pour bien l’impregner. Rajouter de l’eau jusqu’a ce que le couscous devienne doux au toucher et leger quand vous le goutez. Remettre le couscous dans son couscoussier et faites cuire une deuxieme fois pour 15min. Le remettre dans le bol et y ajouter 4c.s de beurre. Laisser le fondre dessus puis, commencer a le melanger avec vos mains quand le couscous aura un peu refroidit. -700ml d’eau ou de bouillon de legumes. 100g de pois-chiche trempe dans l’eau la veille. Faire dorer la viande dans un peu d’huile. Ajouter les oignons, les legumes entiers, le safran , la tomate en conserve, le cumin et sel poivre. Couvrir d’eau et laisser cuire pendant 30 ou jusq’a ce que la viande et les legumes soient cuits. Servir le couscous dans une assiette, les legumes dessus, la viande autour et mouiller de bouillon a votre gout. Cous Cous Friday sounds like a great tradition to me! Okay, I'm sold. But where do you get the special couscous pot? I'm totally willing to go get one to try this method out! Awesome. Next time I'm at my local ME market, I'll see if they have one. It's likely I've walked past them a billion times in the kitchen wares section w/o noticing (okay, in fairness, I'm usually looking at the shisha, not the kitchen wares). If not there, I'll definitely order one online. No need for apologies, Warda! Even when life is moving along too quickly for us, friendships always progress at their own pace and are patient while life catches up. I'm excited to try to grow the pits, though!! please get on youtube and share your dishes with us. thank you so much. i remember these foods when i was little. i am in the usa now expected to deal with fried foods. oh, how much i miss our foods! - Anonymous, one day when I get the courage, and knowledge, to edit a video:)...in the meantime, you can find many Algerian recipes on my blog. Happy cooking and don't give up on our beautiful cuisine for fried food, though some fried food can be irresistible.